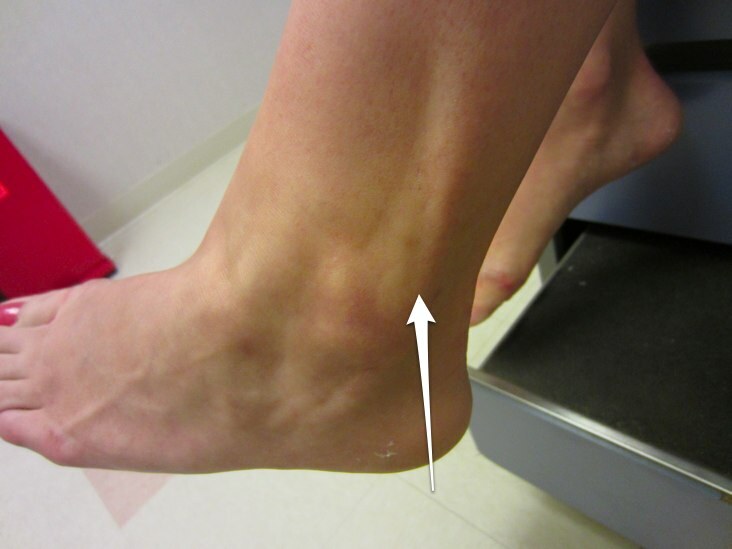 The peroneal tendons are located behind the lateral malleolus on the outside of the ankle (white arrow). One of the uncommon injuries that occurs to the ankle in sports involves the peroneal tendons. These are the tendons that are located behind the lateral malleolus, or the bone on the outside of the ankle. These tendons help turn the foot outward. Although rare, these injuries can occur in sports. The common mechanism of injury involves inversion of the ankle, meaning that the heel of the foot turns inward while the outside of the ankle is forced down. This is also the same mechanism involved in most ankle sprains. When the athlete has traumatic inversion to his ankle, he might injure the tissue that holds the peroneal tendons behind the bone. If this happens, it allows the tendons to slip, or sublux, in front of the bone. This is a difficult injury, as there are no reliable methods to treat the injury without surgery. Although ice, rest, physical therapy, and taping or bracing can be helpful in alleviating pain and swelling and help improve mobility, it is difficult to predict that the subluxation of the tendons will improve. Typically surgery is needed to repair the tissue that holds the tendons behind the bone and prevent the tendons from continuing to snap back and forth over the bone. It can be a fairly debilitating injury if not treated, and most high-level athletes have surgery to fix the problem. Return to sports can take several months. The surgical repair has to heal, and then the athlete has to regain strength and range of motion before returning to sport-specific activities.